IQUIQUE, Chile (CNS) — Christians must be aware of the injustices and exploitation suffered by migrants and those seeking a better life for themselves and their families, Pope Francis said. “Let us be attentive to the lack of steady employment, which destroys lives and homes. Let us be attentive to those who profit from the irregular status of many immigrants, who don’t know the language or who don’t have their papers in order. Let us be attentive to the lack of shelter, land and employment experienced by so many families,” he said Jan. 18 at his final Mass at Lobito beach in Iquique. The pope arrived at the Mass site, a sports field owned by Arturo Prat University of Iquique, shortly after landing at the nearby international airport. Before boarding the popemobile to greet the faithful present, the pope was asked by local journalists about his three-day visit to the country. According to the Vatican, an estimated 50,000 people were present at the Mass, cheering as the pope made his way around the field overlooking the crisp, blue waters of the Pacific Ocean. A vast array of colorful hats and umbrellas were seen across the field as people did their best to shield themselves from the Chilean sun. Behind the pilgrims was one of the many immense sand dunes that characterize the northern city’s landscape. Iquique is one of the major South American cities that has seen a steady increase of migrants from Latin America and the Caribbean, particularly from Venezuela and Haiti. Like the Holy Family, who escaped to the Egyptian desert to survive, migrants have also crossed the sand dunes of Iquique, setting out with the hope of a better life but “always with their bags packed, with fear and uncertainty about the future,” the pope said. Recalling the day’s Gospel reading from St. John, in which Mary informs Jesus of the lack of wine at the wedding feast of Cana, the pope said that, still today, Mary intercedes on behalf of those who lack joy. “She is attentive to everything going on around her; like a good mother, she doesn’t sit still. She notices, amid the feasting and the shared joy, that something is about to happen that might ‘water it down,'” the pope said. “Let us not be afraid to raise our voices and say: ‘They have no wine,'” the pope said. 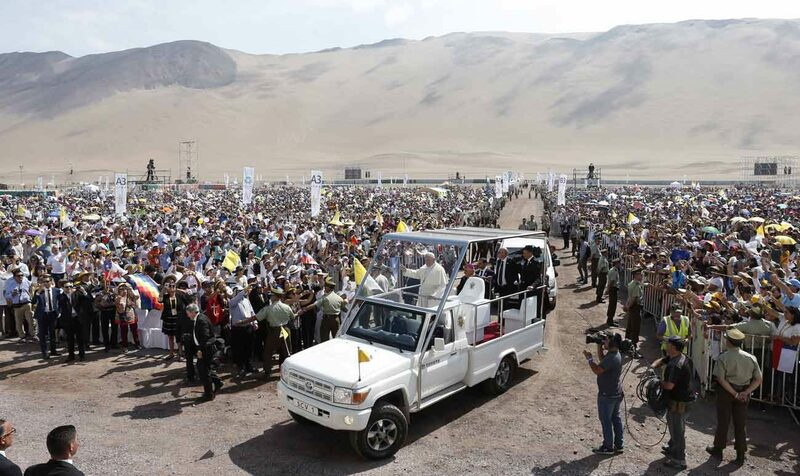 After the Mass, the pope boarded his popemobile to greet the crowds gathered in the streets of Iquique. As he continued along the route, a police horse was startled and reared up, causing the policewoman riding it to fall back and nearly hit the popemobile. The pope was seen telling his driver to stop, and he remained near the injured officer until a medical team came to attend to her.